KUWAIT Finance House (Malaysia) Bhd's (KFHMB) move to not proceed with the purchase of the RM920 million Menara YNH in Kuala Lumpur will not have any impact on prices of properties in the area, say real estate agents. They said prices of land and commercial buildings surrounding the Kuala Lumpur City Centre (KLCC) will stay firm in 2010. YNH Property Bhd had on Tuesday said that it was notified by KFHMB of its intention not to proceed with plans to buy one wing of the office tower in Menara YNH on Jalan Sultan Ismail. "KFHMB has been prudent in its investments and as an investor in Malaysia, it has been doing well," real estate agent Previndran Singhe of Zerin Properties said. He added that the local property market remains unaffected by KFHMB's move. "It is realistic to say that people are cautiously optimistic. Land sales (in the KLCC area) have been in the RM1,900 to RM2,200 per sq ft range. For commercial properties, it is between RM800 and RM1,100 per sq ft. It is definitely holding and is likely to inch up next year," Previn told Business Times. Recently Dijaya Corp Bhd said it was buying the land in Jalan Ampang, which houses the Bok House, for RM123 million or about RM2,200 per sq ft.
DTZ Nawawi Tie Leung Property Consultants deputy managing director Adzman Shah Mohd Ariffin said there has been no indications of distress sales in the KLCC area, due to limited land availability in the area. "(Property) values there seem to be holding well for the time being," he added. CB Re (Malaysia) Sdn Bhd (formerly Regroup Associates Sdn Bhd) managing director Allan Soo said the market remains unaffected by KFHMB's move not to buy Menara YNH, as indications were that there was never a deal between the two in the first place. He expects prices of land in the KLCC area will continue to rise, but the same can't be said for commercial properties with the opening of GTower and The Icon on Jalan Tun Razak which could put pressure on rent. "Sales of office blocks may be just below RM1,000 per square foot," Soo said. He added that land prices will continue to rise due to scarcity of prime land in Kuala Lumpur. PETALING JAYA: Kuwait Finance House (M) Bhd (KFH) has refuted YNH Property Bhd’s claim that it is in a legally binding agreement with the latter and can be made liable for backing out of a deal to purchase Menara YNH, a 45-storey office tower worth RM920mil. In a statement yesterday, KFH said there was “no legally binding agreement” with the Ipoh-based developer because neither party had committed to signing a sale and purchase agreement. “A conditional letter of offer was executed between KFH and YNH but the sale and purchase agreement was not executed as the conditions stipulated in the conditional letter of offer which included the necessary approvals from KFH’s board of directors, shareholders and/or committees were not obtained,” it said. It added that both parties had had “several discussions and meetings thereafter” to agree on a revised structure so as to meet the those conditions. “As both parties were unable to agree on a revised structure and terms of the sale, KFH has decided not to proceed with the purchase of the said Menara YNH. “We may review our decision in the future, should we be able to find a viable structure to enable us to participate in the sale transaction,” KFH said. KFH had offered to buy a 50% interest in YNH Land Sdn Bhd’s Menara YNH early last year. YNH Land is a unit of Kar Sin Bhd, which in turn is a wholly owned subsidiary of YNH Property. YNH told Bursa Malaysia on Tuesday that it had been notified in writing by KFH that the latter would no longer be proceeding with the formalisation of the sale and purchase agreement. In the same note to Bursa, YNH said it was seeking legal advice on the matter. “As such, the board will consult our legal advisers on all of the options available to our group, including but not limited to specific performance and/or seeking damages from KFH,’’ YNH said. Meanwhile, analysts expect the YNH-KFH deal to fall through but it would not have any impact on YNH’s earnings. ECMLibra Investment Research said in a note that the news was “not surprising”. “The partial sale of Menara YNH had been widely expected to fall through following long and protracted negotiations since the offer letter was signed on Jan 11, 2008. “Nevertheless, the positive thing we can see from this turn of events is that the uncertainty of the sale to KFH has finally been drawn to a close,” it said. The research house said it was making no revision to its earnings estimate as it had already disregarded the earnings contribution from the sale to YNH. RHB Research in its report said the deal falling through was “not a surprise to us”, and added that it was not revising its earnings forecast for the developer. An analyst said YNH would have no problem finding another buyer for the tower, albeit at a lower selling price than the RM920mil KFH had agreed to. 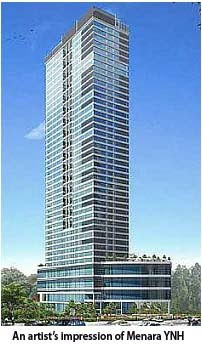 Menara YNH, which is yet to be built, will be located in Jalan Sultan Ismail, Kuala Lumpur. Selling prices in the area have nosedived 20% to 25% since the offer by KFH. “The economy is already improving but we expect flattish growth for the property sector in 2010. It would take a while for property prices to match the levels they were at in the last quarter of 2008,” an analyst said. Zerin Properties chief executive officer Previndran Singhe concurred that YNH would have no problem finding a buyer for Menara YNH, adding that prices of properties within the area were showing signs of improvement. “Property prices may reach last year’s levels by end-2010. But by 2011, there should be no problem for YNH to sell at a higher price (than what was offered by KFH),” he said. KUWAIT Finance House (M) Bhd (KFHMB) said it does not have a legally binding agreement to buy a building from YNH Property Bhd. The Islamic bank has abandoned plans to buy half of Menara YNH on Jalan Sultan Ismail, Kuala Lumpur, for RM920 million and YNH said it would seek legal advice and claim damages. KFHMB was responding to media reports on KFHMB decision not to go ahead with the RM920 million en bloc purchase of Menara YNH on Jalan Sultan Ismail, Kuala Lumpur. "A conditional letter of offer was executed between KFHMB and YNH but the sale and purchase agreement was not executed as the condition letter of offer which amongst others includes the necessary approvals from KFHMB's board of directors, shareholders and/or committee were not obtained," KFHMB said in a statement yesterday. It added that the parties had several talks and meetings on a revised structure to meet approvals and other conditions in the letter. "As both parties were unable to agree on a revised structure and the terms of the sale, KFHMB has decided not to proceed with the purchase of the said Menara YNH," it added. SHAH ALAM: Property developer Lebar Daun Development Sdn Bhd will next year launch at its various projects a total 14 new phases with a total gross development value (GDV) of RM500mil. Eight new phases would be unveiled at the upmarket D’Kayangan mixed development and five at Bukit Bandaraya Shah Alam, located at Section 13 and Section 8 in Shah Alam respectively. Executive director Noorazhar Mohamed Nurdin said these phases would comprise terrace houses, semi-detached units and bungalows, with a starting price of RM670,000. “We have new and exciting products in the pipeline,” he told StarBiz yesterday, adding that Lebar Daun would be launching projects every month next year. He said an ongoing residential development in Sri Kembangan would also have a new phase. Even though the economy was still recovering, sales and marketing manager Arman Putera Asmuni said Lebar Daun would continue to launch new phases and not hold back. “If we only launch when the economy improves, we will be at pace with our competitors. By continuing to launch, we will already have completed products (compared with other players) when the economy is good,” he said. Work on D’Kayangan, which sits on 163 acres of leasehold land, started in 2005. To be developed in 13 phases, the project has a GDV of RM1.6bil and is slated for completion in 2015. D’Kayangan will feature over 1,300 superlink homes, semi-detached houses, cluster homes and bungalows. About 40 acres have been dedicated to commercial development. Its 300-acre Bukit Bandaraya Shah Alam project, to be developed in 15 phases, has a GDV of RM1.2bil. Lebar Daun would also be launching a high-rise mixed development in Section 14, Shah Alam by the end of 2010 with a GDV of RM200mil. Bank Islam Malaysia Bhd may indirectly become a property developer as it explores the prospect of developing wakaf land into property projects. It is in talks with various Islamic religious and economic agencies, such as Yayasan Wakaf Malaysia, on developing wakaf land nationwide. Group managing director Datuk Seri Zukri Samat said that instead of just providing the financing, the bank could also become joint project owner. "We will play a key role in the development of wakaf land in the country. While being a lender, we may also go a step further to becoming joint project owner." Zukri was speaking at a press conference after the opening of Bank Islam's 95th branch in Kota Damansara, Selangor, yesterday. Bank Islam has already invested in its first wakaf land venture in Kuala Lumpur, although neither as a joint project owner nor a developer. Instead, the bank will be the anchor tenant of a 34-storey building in the "Golden Triangle" now being developed by its parent, Lembaga Tabung Haji. The pilgrimage fund, which owns 52 per cent of Bank Islam through the latter's holding company, BIMB Holdings Bhd, is developing the RM151 million building on 0.48ha of wakaf land. The land belongs to the Federal Territory Religious Affairs Council. Construction works on the land along Jalan Perak, off Jalan P. Ramlee, started in 2007 and the building itself is expected to be ready next year. about one-third of Bank Islam, may sell its stake if it receives a good offer. He declined to elaborate. He also said that Bank Islam plans to open at least 10 more branches next year, which will swell its banking network to more than 100 branches. The sites for six new branches have been identified and they include Alor Star in Kedah, Bukit Jelutong in Selangor and Sri Petaling, Kuala Lumpur. Each branch should cost around RM600,000 to set up. Zukri was optimistic that Bank Islam would again achieve double-digit growth next year given the encouraging trend it has seen since last month. The bank expects its deposits and lending to grow substantially next year. Bank Islam will soon change its financial year-end to December 31 from June 30 to be in line with Tabung Haji's financial year. Investors looking for a blue chip commercial property to add to their portfolio can check out Setia Haruman Sdn Bhd's latest project, CBD Perdana 2 in Cyberjaya, Selangor. Under the first phase, it had generated gross returns of about 10 per cent per year for its owners. CBD Perdana 2 promises to offer a similar competitive investment advantage and equally good returns. In a statement, Setia Haruman said CBD Perdana 2 is based on an award-winning "Office Park" con-cept evolving around an architectural design that creates a "green and vibrant" work environment. Expected to be completed by October 2011, CBD Perdana 2 is touted to be the new commercial highlight of Cyberjaya; offering signature retail space and corporate office units. The built-up area of the units ranges from 2,2821,776 sq ft to 2,5733,121 sq ft. Located within the central business district of Cyberjaya, CBD Perdana 2 enjoys a ready consumer catchment from the 900,000 population of Cyberjaya, Putrajaya, Kajang, Seri Kembangan, Puchong and Dengkil; accessibility via major highways; and comprehensive facilities in the neighbourhood such as an international school and three private established universities and colleges. Setia Haruman, which is the master developer of Cyberjaya, said rental returns of CBD Perdana 2 are expected to be RM3 and above per sq ft.
For a limited time only, purchasers of CBD Perdana 2 units will get to enjoy various incentives under a flexible financial package offered at attractive interest rates; with zero progressive interest during construction. KPJ Healthcare Bhd (KPJ) has entered into a conditional sale and purchase agreement with Property Base Development Sdn Bhd to buy the seven-storey Maharani Specialist Hospital in Muar, Johor, for RM22 million. The deal, signed by KPJ’s wholly-owned unit Maharani Specialist Hospital Sdn Bhd, includes the 6.9 million sq m of land which the hospital is sited on. The Maharani Specialist Hospital building is partially completed and upon completion by the end of 2011, it will be a private specialist hospital. The estimated further development cost on the property is RM26 million. Construction group Bina Goodyear Bhd (7023) expects to return to profitability in its current fiscal year, on increased construction work and contributions from its electronics division. It has some RM500 million worth of contracts that will keep it busy for the next 12 months. "We expect to return to the black in the current year ending June 30 2010, with a revenue of some RM350 million. These profits will come from our existing and new contracts," chairman Md Azar Ismail told Business Times after the group's shareholders meeting in Subang, Selangor, yesterday. He said the group expects to win another contract within the next few months, which would boost its earnings. He declined to elaborate. Bina Goodyear posted a net loss of RM24.24 million on revenue of RM333.8 million for the fiscal year ended June 30 2009. Md Azar said it is bidding for a few building jobs in Putrajaya. He added that the group is positive on the outlook for 2010 due to tender invitations from the government and new property launches by private developers. "We are focused on building construction works in the Klang Valley. But, if there's an opportunity to do projects in Johor's Iskandar region, we will consider, provided that the contract has substantial value," he said. Bina Goodyear, via its 75.5 per cent unit TC Electronics Sdn Bhd, also makes automotive and home loud speakers. Md Azar said the business is improving. TC Electronics is one of the key OEM car speaker suppliers for Proton and Perodua. It also supplies its products to international speaker manufacturers such as the JVC group and Alpine Group. Meanwhile, Bina Goodyear senior general manager Lawrence Lau said the group is looking to re-activate its property development business. It had moved away from the division to focus on construction due to poor market sentiments. Bina Goodyear recently sold its only parcel of land, measuring 8.6 acres, in Bandar Sri Damansara for RM27 million, to fund working capital and reduce debt to RM68 million. "We are sourcing for land in the Klang Valley to build medium-cost buildings and medium- to high-end land properties in the near future," he said. Ho Hup Construction Co Bhd’s 70 per cent subsidiary Bukit Jalil Development Sdn Bhd plans to sell 13,398 sq m of freehold land in Bandar Bukit Jalil for RM7.64 million to Action Master Sdn Bhd. Proceeds will be used to repay borrowings and fund working capital. Ho Hup will realise a gain of RM520,181 from the sale.